WARNING: This firmware is pre-release firmware. It may temporarily cause your Netduino Mini to cease functioning properly. If this firmware does not work for you, you will likely need to erase your Netduino Mini completely and re-flash the production v4.1.0.5 bootloader using Atmel SAM-BA tools (on a 32-bit Windows installation) and the production v4.1.0.5 firmware using MFDeploy. Reflashing a Netduino Mini after a full erase requires an RS232 connection to your Netduino Mini. Hi Chris. This is exactly what happened to me. My Mini was working just fine with firmware 4.1.0.5, and I probably should have sticked with it! But I was too excited by the SD support and thought I would flash this Alpha version. But I picked the wrong version I guess and now am stuck. My deployment port was TTL (11 and 12), and my UART was working just fine (the last working running program keeps sending characters on the UART and I received them as expected). The trouble is that I flashed the UART version of 4.1.1 alpha 3, instead of the TTL, I guess. So now my TTL deployment port does not answer anymore (no ping possible from MFdeploy etc), and the program still runs and occupies the UART (I can still see the character flow output from the UART). 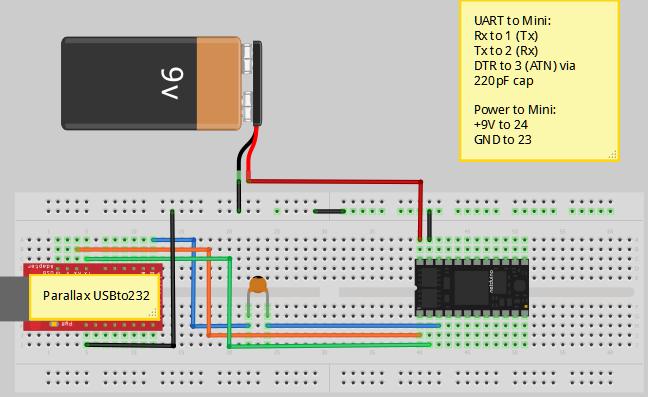 I have tried SAM-BA on the UART with no success (and I also tried on TTL as well, same result), choosing "at91sam7x512-ek" as the board; but SAM-BA wouldn't connect, maybe because my running program keeps the UART busy I suppose. My question: is there a way to force SAM-BA to work, or am I just hosed? 1. Connect a jumper wire between pin 21 (5V power) and pin 3 (DTR). 2. Remove power from your Netduino Mini. 4. Start up MFDeploy, select the serial port of your TTL cable. 6. Press PING in MFDeploy. You should get a "TinyBooter" response. 7. Now, deploy the proper firmware. You can erase your app if desired as well. Unfortunately on step 6, Ping still returns "No response from device" (and DTR is forced high). I have a working UART on 1 and 2. What should I do with it? 1. Connect 3.3V or 5V power to the gold ERASE pad (which is next to pins 11 and 12). This will fully erase your Netduino Mini, the .NET MF firmware, and your Netduino Mini app. 2. Depower your Netduino Mini. 3. Repower your Netduino Mini. 4. Using SAM-BA, connect to the RS232 port on your Netduino Mini. 5. 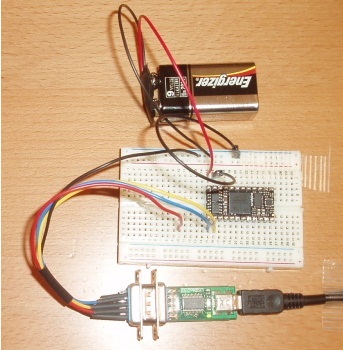 Flash the v4.1.0.5 firmware's TinyBooterDecompressor.bin file to your Netduino Mini. 6. Depower your Netduino Mini. 7. Repower your Netduino Mini. 8. Using MFDeploy, connect to the RS232 port on your Netduino Mini and flash the desired firmware (TTL or RS232). Procedure 2 did not work either, so I erased the chip by applying 5V on the gold pad. I can see that this changed something as my mini app does not emit anymore on the UART output. I am confident that my UART cable works (its a Parallax USBto232), which I just tested on by Basic Stamp 2, which as you know have the same pins than the Mini with respect to 1, 2, 3, and power. So I can still communicate with the BS2 with Basic Stamp Editor via the UART, but still cannot communicate with the blanked Netduino Mini with SAM-BA via UART, using the same setting. I even inserted the same 220pF cap between the DTR signal and pin 3, just like what I had on the BS2. What board do you have to select on SAM-BA? Is this "at91sam7x512-ek", as the spec for the Mini has an AT91SAM7X512, or is this another board? Thanks for your support on a Thanksgiving break! I scanned Rx(pin 2) and Tx(pin 3) on the mini. Pin 2 and 3...or pin 1 and 2? Can you take a photo of your setup? Honestly, there's very little that can go wrong in an erase-and-reflash operation as long as the serial port supports true RS232. I have noticed that some USB-RS232 adapters have trouble with SAM-BA. Do you have a camera on your mobile phone? The only camera I have is on my phone which is out of order. I'll manage to send a picture tomorrow though. The USB to RS232 that I use is the one from Parallax. I'll check tomorrow if it does real RS232 or not, too bad that I don't have a real scope. Thanks for now Chris, I really appreciate your support. I have posted a support request to Parallax in order to get more information on their USBto232, as there is no datasheet available on their site. When I start the UI, the dialog box below appears, I select the board (at91sam7xc512-ek) and click Connect. The dialog disappears and nothing visually happens. As said before there are 3 bytes (0x6c 0xee 0x7d)sent to chip via the UART , and nothing received. I need to kill the process via Task Manager to release the com port. 1) Is it possible that I use a wrong version of SAM-BA? Maybe you can post the link to the version that you use at Secret Labs? 2) The doc (readme_cdc.txt) mentions that this version only works with a USB CDC Driver. The driver that I am using on the COM5 port is FTDI; this may be a problem, but there is no USB CDC Driver that I can find for Windows 7. Would you have a pointer to such a driver? Chris, could you post TinyBooterDecompressor.bin for Mini? <Import> declaration is correct, and that the file exists on disk. First of all, so glad that SAM-BA is now working for you. Yes, a word of warning: the new SAM-BA v2.10 struggles a bit on Windows 7 in the drivers department. I personally downgraded to SAM-BA 2.09 on my Windows 7 machine. It was a rather long thread that somehow polluted your Netduino Mini (Beta) announcement, so feel free to discard what you think should be removed. And a big thanks for your support again. Case closed. Is there a link to SAM-BA 2.09 ? I'm currently trying to flash my mini running into the same issue. Welcome to the Netduino community. What issue are you having, exactly, flashing a Netduino Mini using SAM-BA 2.10 on your computer?